aFrom the Translational and Molecular Imaging Institute (P.B. )bDepartment of Radiology (P.B., T.P.N. ), Icahn School of Medicine at Mount Sinai, New York, New York. bDepartment of Radiology (P.B., T.P.N. ), Icahn School of Medicine at Mount Sinai, New York, New York. SUMMARY: At ultra-high magnetic fields, such as 7T, MR imaging can noninvasively visualize the brain in unprecedented detail and through enhanced contrast mechanisms. The increased SNR and enhanced contrast available at 7T enable higher resolution anatomic and vascular imaging. Greater spectral separation improves detection and characterization of metabolites in spectroscopic imaging. Enhanced blood oxygen level–dependent contrast affords higher resolution functional MR imaging. Ultra-high-field MR imaging also facilitates imaging of nonproton nuclei such as sodium and phosphorus. These improved imaging methods may be applied to detect subtle anatomic, functional, and metabolic abnormalities associated with a wide range of neurologic disorders, including epilepsy, brain tumors, multiple sclerosis, Alzheimer disease, and psychiatric conditions. At 7T, however, physical and hardware limitations cause conventional MR imaging pulse sequences to generate artifacts, requiring specialized pulse sequences and new hardware solutions to maximize the high-field gain in signal and contrast. Practical considerations for ultra-high-field MR imaging include cost, siting, and patient experience. From the initial grainy images of the human brain obtained in the late 1970s,1 MR imaging has progressed to provide exquisite images of brain anatomy and function and metabolic composition, making MR imaging integral to nearly all current neurologic evaluations.2 Two major determinants of MR image quality, SNR and contrast, both increase with field strength (Table).3,4 Therefore, MR imaging scanners operating at field strengths of 7T (and up to 11.7T) have the potential to improve lesion detection, enhance lesion characterization, improve treatment planning, and help elucidate the mechanisms underlying disease. This review addresses the advantages and limitations of ultra-high-field MR imaging and MR spectroscopy and discusses some of the major clinical applications to the brain. Physical and technical challenges of high-field MR imaging and some current solutions to these challenges are outlined, as are practical aspects of placing an ultra-high-field scanner in an imaging facility. Because SNR scales with field strength (Table),4,5 7T MR imaging provides higher resolution images within reasonable scanning times, compared with lower field studies.6⇓⇓⇓⇓⇓⇓–13 At 7T, therefore, MR imaging displays finer anatomic detail, increases lesion conspicuity, and more accurately characterizes brain abnormalities. 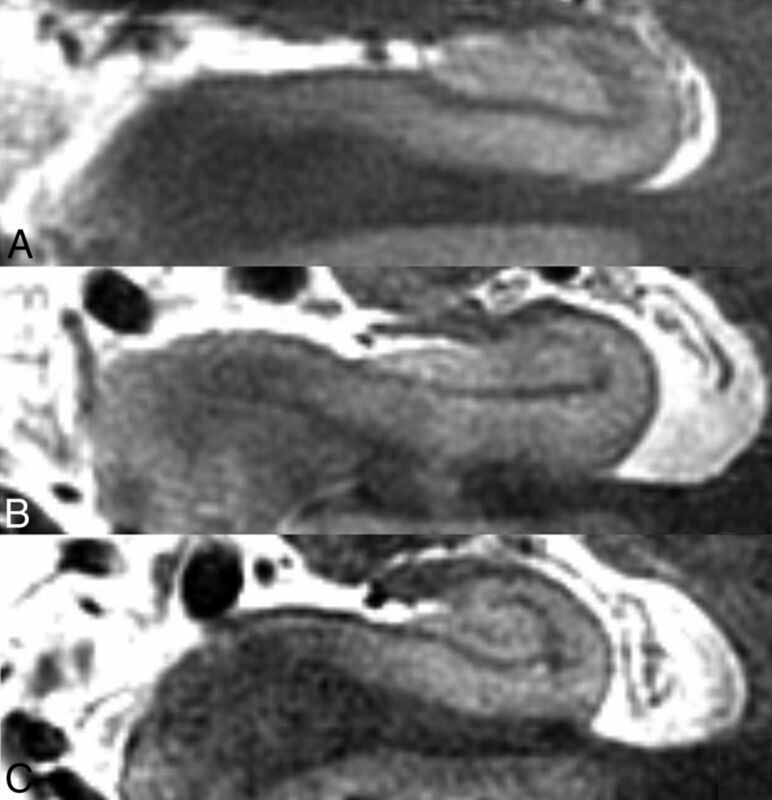 Figure 1, for example, illustrates 7T axial and coronal-oblique turbo spin-echo images of the hippocampus obtained from healthy volunteers at 450-μm in-plane resolution and 2-mm section thickness. 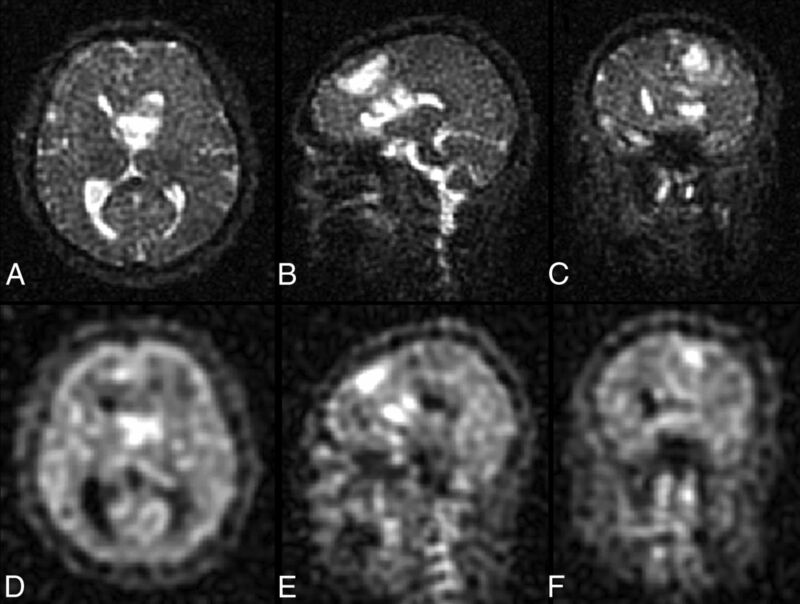 High-resolution axial (A) and coronal oblique (B) images of the brain obtained at 7T. The 450-μm in-plane resolution enables visualization of the hippocampus in fine detail. C, Effective hippocampal subfield segmentation may be performed on a 7T TSE image. Subfields were manually traced courtesy of Dr Jason Bini on high-resolution coronal TSE images on OsiriX Image Viewing Software (http://www.osirix-viewer.com) by using the segmentation work by Van Leemput et al102 as a guide. Scanner: whole-body 7T MR imaging (Magnetom; Siemens). RF coil: Nova 32-channel head coil (Nova Medical, Wilmington, Massachusetts). Scan parameters: number of sections = 25, section thickness = 2 mm, FOV = 23 cm, grid size = 512 × 512, resolution = 0.44 × 0.44 × 2 mm3, scanning time = 6 minutes and 30 seconds. Increasing the field strength provides opportunities for novel MR imaging contrast mechanisms, including improved susceptibility, blood oxygen level–dependent (BOLD) and flow-dependent contrast. MR imaging sensitivity to susceptibility effects scales with field strength (Table), making it possible to more effectively depict venous microvasculature, microbleeds, and iron and calcium deposits through susceptibility-weighted imaging.14 Figure 2 illustrates a MIP of an SWI obtained at 7T. MIP of a 7T susceptibility-weighted image of the brain of a healthy volunteer revealing tiny venules in the cortex. Scanner: whole-body 7T MR imaging (Magnetom; Siemens). RF coil: Nova 32-channel head coil. Scan parameters: resolution = 0.2 × 0.2 × 1.5 mm3, MIP thickness = 12 mm over the set of sections, scanning time = 6 minutes and 2 seconds. The T1 values of tissue increase with field strength (Table). At 7T, the higher SNR and longer T1 values for tissue enhance suppression of static background signal in TOF angiography, increasing overall contrast and the detectability of smaller arteries.18 Figure 3 shows a TOF image obtained at 7T depicting the multiple arterial branches arising from the anterior and middle cerebral trunks. Time-of-flight angiography performed on a healthy volunteer at 7T. Axial and sagittal MIP of TOF images are shown. Scanner: whole-body 7T MR imaging (Magnetom; Siemens). RF coil: Nova 32-channel head coil. Scan parameters: resolution = 0.26 × 0.26 × 0.4 mm3, scan time = 7 minutes and 56 seconds. The chemical shift differences among metabolite resonances are directly proportional to field strength (Table). 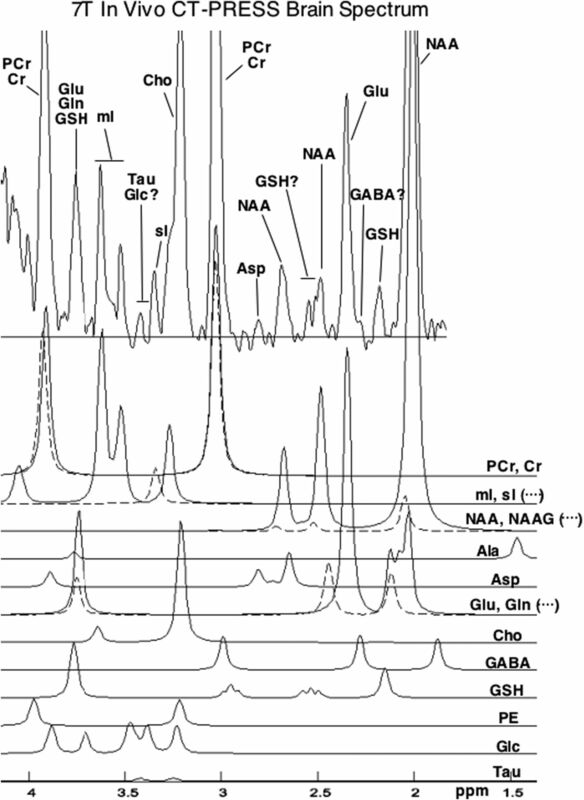 The combination of increased SNR and increased spectral separation of metabolite peaks results in higher resolution spectroscopic images and improved spectral quantification.5 Figure 4 shows a spectrum obtained at 7T with a constant time point-resolved spectroscopic (CT-PRESS) pulse sequence described by Mayer and Spielman.19 Greater numbers of metabolites become detectable as SNR and peak separation increase. In vivo brain spectra acquired on a healthy volunteer by using a CT-PRESS sequence at 7T. Spectrum is courtesy of Drs Dirk Mayer and Daniel Spielman, Stanford University, Stanford, California. Plotted below the in vivo data are simulated spectra of individual metabolites, as generated by the CT-PRESS acquisitions.103 Metabolites shown are: phosphocreatine (PCr), creatine (Cr), myo-inositol (mI), scyllo-inositol (sI), N-acetylaspartate (NAA), N-acetyl aspartylglutamate (NAAG), alanine (Ala), aspartate (Asp), glutamate (Glu), glutamine (Gln), Choline (Cho), gamma-aminobutyric acid (GABA), glutathione (GSH), phosphoethanolamine (PE), glucose (Glc), taurine (Tau). Scanner: 7T whole-body scanner (MR950; GE Healthcare, Milwaukee, Wisconsin). RF coil: Nova head coil. Scan parameters: resolution = 2 × 2 × 2 cm3; voxel centrally located in the supertentorial brain, scanning time = 5 minutes. 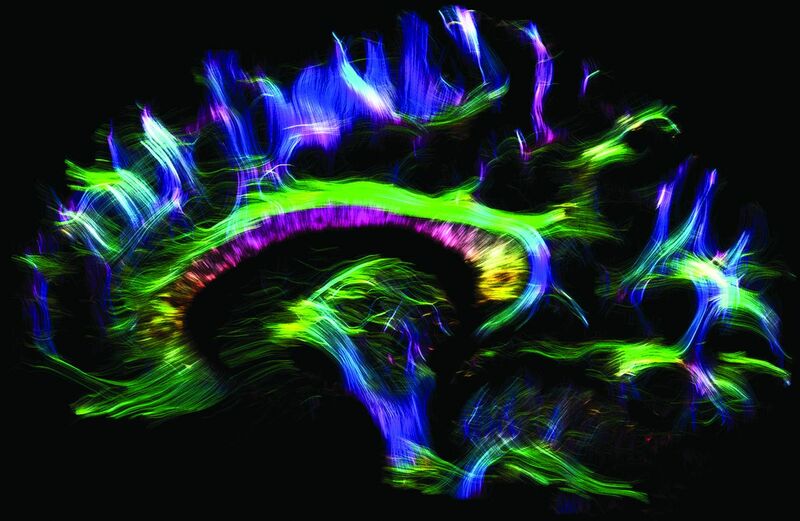 Tractography performed by using diffusion imaging at 7T with readout-segmented EPI and parallel imaging. Image courtesy of Dr Robin Heidemann, Max Planck Institute for Human Cognitive and Brain Sciences, Leipzig, Germany. Scanner: whole-body 7T MR imaging (Magnetom; Siemens). RF coil: Nova 24-channel head coil. Scan parameters: b-value of 1000 s/mm2, resolution = 1 × 1 × 1 mm3, 30 diffusion directions, generalized autocalibrating partially parallel acquisition acceleration factor = 3, TE/TR = 60/11,000 ms, scanning time = 75 minutes. Sodium brain image of a healthy volunteer obtained at 7T using a 3D attenuation-adapted projection reconstruction. Images courtesy of Dr Armin Nagel, the German Cancer Research Center, Heidelberg, Germany. Scanner: whole-body 7T MR imaging (Magnetom; Siemens). RF coil: double-resonant (1H = 297.2 MHz; 23Na = 78.6 MHz) quadrature birdcage coil (Rapid Biomed, Rimpar, Germany). Scan parameters: resolution = 2 × 2 × 2 mm3, scanning time = 20 minutes. 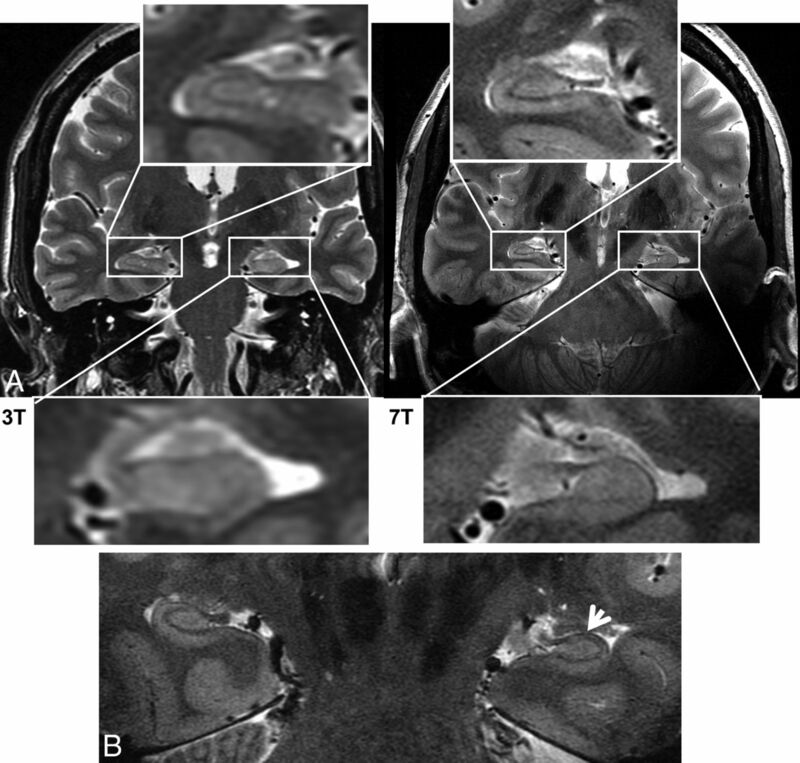 The improved resolution and novel contrast mechanisms available at 7T show structural and biochemical abnormalities in greater detail to delineate seizure foci, aid in surgical planning, and improve patient outcome. 7T detection of abnormalities not visible at 3T may obviate invasive evaluation through depth electrodes or provide the data needed to establish concordance with invasive evaluations. 7T MR imaging has already shown value for characterizing hippocampal sclerosis,38,42 cortical dysplasias,43 and vascular malformations44 associated with epilepsy. Figure 7A compares 3T and 7T FSE images in a patient with epilepsy with subtle left hippocampal abnormalities. Figure 7B shows the benefit of 7T imaging in a second patient with mesial temporal lobe epilepsy. A, 3T and 7T coronal FSE images obtained for a patient with mesial temporal lobe epilepsy. Subtle left hippocampal abnormalities are visualized in greater detail in the 7T image. B, In a second patient with mesial temporal lobe epilepsy, loss of gray matter in the left hippocampus is detected at 7T (white arrow), after no abnormalities were reported at 3T. Images are courtesy of Drs Michael Zeineh, Manoj Saranathan, and Brian Rutt, Stanford University, Stanford, California. Scanners: whole-body 3T and 7T MR imaging (MR950; GE Healthcare). RF coils: standard 3T head coil (GE Healthcare) and Nova 7T head coil. Scan parameters: section thickness = 2 mm, resolution = 0.22 × 0.22 × 2 mm3, scanning time = 10 minutes. A–C, Images of total sodium content for a patient with a glioblastoma of the mesial frontal lobe. Total sodium signal is elevated in tumor tissue. D–F, Images of relaxation-weighted sodium signal of the same patient. This provides sodium levels from a different tissue compartment and is only elevated in the central portion of the tumor. Images are courtesy of Drs Armin Nagel and Armin Biller, German Cancer Research Center, Heidelberg, Germany. Scanner: whole-body 7T MR imaging (Magnetom; Siemens). RF coil: rapid double-resonant (1H = 297.2 MHz; 23Na = 78.6 MHz) quadrature birdcage coil. Scan parameters: resolution = 2.5 × 2.5 × 2.5 mm3, scanning time = 13 minutes (A–C); resolution = 5.5 × 5.5 × 5.5 mm3, scanning time = 10 minutes (D–F). Total sodium images and relaxation-weighted sodium images provide complementary data. In particular, 23NaT images provide a volume-weighted average of the intra- and extracellular sodium concentration, while the 23NaR images provide signal from a compartment defined by 23Na relaxation properties rather than intra- or extracellular histologic compartments. Nagel et al25 found that total sodium was elevated in all tumor types. However, the relaxation-weighted sodium signal was elevated only in glioblastomas, not in WHO grades I–III tumors. 23NaR, therefore, provides a noninvasive method for correct MR imaging distinction between WHO grade IV gliomas and WHO grades I–III tumors. In Figure 8, the total sodium signal is elevated in the entire tumor, while the relaxation-weighted signal increase is localized to the central tumor portion, consistent with the influx of 23Na into cells in that region. Another MR imaging parameter, intratumoral susceptibility signals (ITSSs), correlates with tumor malignancy and may contribute to a grading system for gliomas.49,50 Park et al50 showed that the Spearman correlation coefficients between ITSS degree and glioma grade were 0.88 (95% CI, 0.79–0.94). Microvascular proliferation is a primary feature of glioblastoma, often resulting in microhemorrhages. These act as the source of ITSS within these lesions. Hemorrhage is an uncommon feature of B-cell primary CNS lymphoma, resulting in little-to-no ITSS within these lesions.51 Therefore, in addition to helping to grade gliomas, ITSS is useful for differentiating glioblastoma and primary CNS lymphoma.51 Because 7T MR imaging enhances sensitivity to susceptibility effects, 7T offers improved contrast and more detailed assessment of ITSS. Figure 9 shows TSE imaging and SWI acquired at 3T and 7T for a patient with a histopathologically confirmed left temporal glioblastoma. The MR imaging was performed before neurosurgery or any other treatment. ITSSs are more apparent and better resolved in the 7T SWI. The structural appearance of the tumor may be assessed in fine detail in Fig 9A. A, High-resolution TSE image of a left temporal glioblastoma. B, 7T SWI provides improved depiction of intratumoral vessels and hemorrhages (white arrow) compared with SWI at 3T (C). Images are provided by Dr Alexander Radbruch, Heidelberg University Hospital and German Cancer Research Center, Heidelberg, Germany. Scanner: whole-body 7T MR imaging (Magnetom; Siemens). RF coil: Nova 32-channel head coil. Scan parameters: resolution = 0.3 × 0.3 × 2 mm3, scanning time = 4 minutes and 13 seconds (A); resolution = 0.7 × 0.7 × 2.5 mm3, scanning time = 3 minutes and 18 seconds (B); resolution = 0.4 × 0.4 × 0.4 mm3, scanning time = 6 minutes and 17 seconds (C). 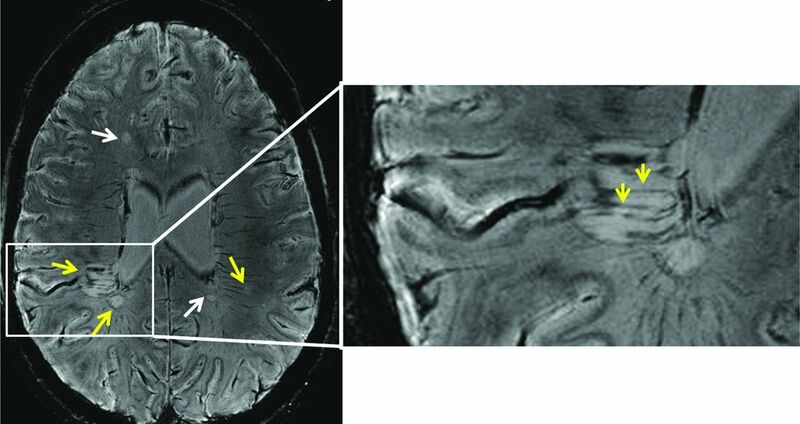 7T MR imaging has particular utility for visualizing the pathologic features of MS. The addition of 7T anatomic scans to clinical 3T imaging protocols improves classification of lesions at the cortical boundary52 and improves the detection and display of gray matter lesions.10 Local field shift maps that are sensitive to susceptibility differences in tissue have been used to quantify the pathologic increase in iron concentration in the basal ganglia of patients with MS versus controls.53 This method has also been used to detect iron-rich macrophages at the periphery of MS plaques.53 Early active MS lesions may be associated with venular dilation, and chronic lesions, with venular pruning and loss.54 Any vascular pathology associated with MS lesions may be assessed in vivo through highly sensitive T2* and susceptibility-weighted imaging at 7T.55,56 SWI at ultra-high fields also allows very effective depiction of the tiny venules within plaques in the cortex as shown in the image obtained at 7T from a patient with MS in Fig 10. 7T SWI of a patient with MS. MS plaques (white and yellow arrows) and tiny veins within MS plaques (yellow arrows) become visible with the high resolution and enhanced contrast afforded by the 7T scanner. Images courtesy of Professor Siegfried Trattnig and Dr Günther Grabner, Medical University of Vienna, Vienna, Austria. Scanner: whole-body 7T MR imaging (Magnetom; Siemens). RF coil: Nova 32-channel head coil. Scan parameters: SWI sequence: resolution = 0.3 × 0.3 × 1.2 mm3, scanning time = 10 minutes. One early pathologic change in Alzheimer disease is neuronal loss in specific subfields of the hippocampus.57 High-resolution hippocampal imaging at 7T has been proposed as an effective tool for revealing these changes.9 7T MR imaging has already shown differences in the cornu ammonis 1 hippocampal subfield of patients with mild Alzheimer disease compared with controls.35 Figure 11 illustrates 7T images of the left hippocampus of age-matched healthy individuals (A) versus those with amnestic mild cognitive impairment (B) and probable Alzheimer disease (C). With increasing disease severity, the stratum radiatum/lacunosum-moleculare (thin apical dark band of tissue) becomes thinner, the dentate gyrus/CA3 region becomes greatly diminished in size, and the entire hippocampus shrinks in relation to the surrounding CSF. Left hippocampus imaged at 7T across aged-matched patient populations. Healthy control (A), amnestic mild cognitive impairment (B), and probable Alzheimer disease (C). Images courtesy of Drs Jeffrey Bernstein, Brian Rutt, and Geoffrey Kerchner, Stanford University, Stanford, California. Scanner: whole-body 7T MR imaging (MR950; GE Healthcare). RF coil: Nova 32-channel head coil. Scan parameters: FSE sequence: section orientation = coronal oblique intersecting perpendicular to longitudinal axis of hippocampus, TE/TR = 49/6000 ms, 16 sections, section thickness = 1.5 mm, resolution = 0.22 × 0.22 × 1.5 mm3, scanning time = 13 minutes. Ultra-high-field MR imaging is also being used to investigate the possible increase in tissue iron associated with early-stage amyloid pathology. The cerebral cortex of patients with Alzheimer disease was studied by 7T T2*-weighted imaging to calculate the relative phase shift, a parameter that is sensitive to iron content. This study revealed increased phase shift within the cortex of patients with Alzheimer disease versus controls.58 Therefore, relative phase shift, measured through 7T T2*-weighted imaging, may serve as a potential early imaging marker for Alzheimer disease. The etiology of mood and anxiety disorders such as major depressive disorder remains poorly understood.59 Study results have been divergent, with no clear consensus on proper neuroimaging markers for these conditions.2,60 However, it is known that the medial prefrontal cortex and temporolimbic structures, including the hippocampus and amygdala, are critical nodes in major depression.57,61⇓–63 Furthermore, high-spatial-resolution MR imaging at 4.7T and 7T successfully differentiates among hippocampal subfields and should, therefore, provide a more sensitive marker for psychiatric disease than does total hippocampal volume.12,13,64 Huang et al65 have already conducted high-field (4.7T) hippocampal subfield analysis in a group of patients with major depressive disorder, showing volume reductions in the cornua ammonis 1–3 and dentate gyrus hippocampal subfields and the posterior hippocampal body and tail for unmedicated patients with major depressive disorder versus controls. Further comprehensive high-field studies combining high-resolution anatomic scans with DTI and 1H-MRSI should help in detecting morphologic abnormalities, disruptions in connectivity,66 and reduced glial and neuronal cell attenuation67⇓–69 associated with psychiatric disorders. The present use of ultra-high-field MR imaging is limited by technical and patient concerns. The technical issues include inhomogeneity of both the main magnetic field and the applied radiofrequency (RF) field (B1), errors in chemical shift localization, and increased deposition of RF power within the patient. These cause image artifacts, limit section number/spatial coverage, and limit the use of MR spectroscopy. B0 inhomogeneity directly scales with field strength (Table). In MR imaging, this results in distortion of both the geometry and the intensity of images. Single- or few-shot rapid acquisition schemes such as echo-planar imaging or spiral imaging are particularly susceptible to geometric distortions due to susceptibility effects. In MR spectroscopy, B0 changes among voxels manifest as spectral shifts for the metabolite peaks. As a result, frequency-selective pulses that are designed to operate on particular spectral bands are less effective. Water and lipid suppression techniques become less effective. The varying B0 field within a voxel broadens the metabolite peaks, reduces the SNR, and increases peak overlap. To combat this effect, robust referencing schemes, advanced B0 shimming, and decreased voxel volumes are required. One of the most difficult problems to overcome at high magnetic fields is the severe B1 inhomogeneity over the volume of interest. As the B0 field increases to 7T, the RF operating wavelength becomes comparable with the diameter of the human head, resulting in a severe reduction of B1 strength in the brain periphery compared with the isocenter.70 This ultimately leads to signal drop-out and unexpected changes in contrast. Standard pulse sequences using conventional RF pulses for excitation and refocusing are very susceptible to changes in B1, resulting in spatially varying contrast and SNR in structural and spectroscopic images. Lack of an RF Transmit Body Coil. A third major technical issue has been the lack of an RF transmit body coil, making it necessary to integrate a dedicated RF transmit coil into head RF coil designs. This integration increases the complexity of RF head coil design. A few robust transmit/receive head coils are now becoming available for use at 7T, potentially resolving this problem. Such coils are usually supplied by the manufacturer at the time of scanner purchase. RF power deposition, measured as the specific absorption rate (SAR), theoretically increases as the square of B0. Although other effects may partially compensate for this in practice, there is still a tighter limit on the number, duration, and amplitude of applied RF pulses in a given time period at 7T compared with 3T. For some commonly used MR imaging pulse sequences that use many closely spaced high-flip-angle RF pulses, such as fast spin-echo or turbo spin-echo (depending on the vendor), these pulses severely limit the number of sections that may be acquired. See Fig 12 for the simulated B1 and SAR in the brain at 7T compared with 3T. Differences between the transmitted B1 fields and the specific absorption rates at 3T and 7T. 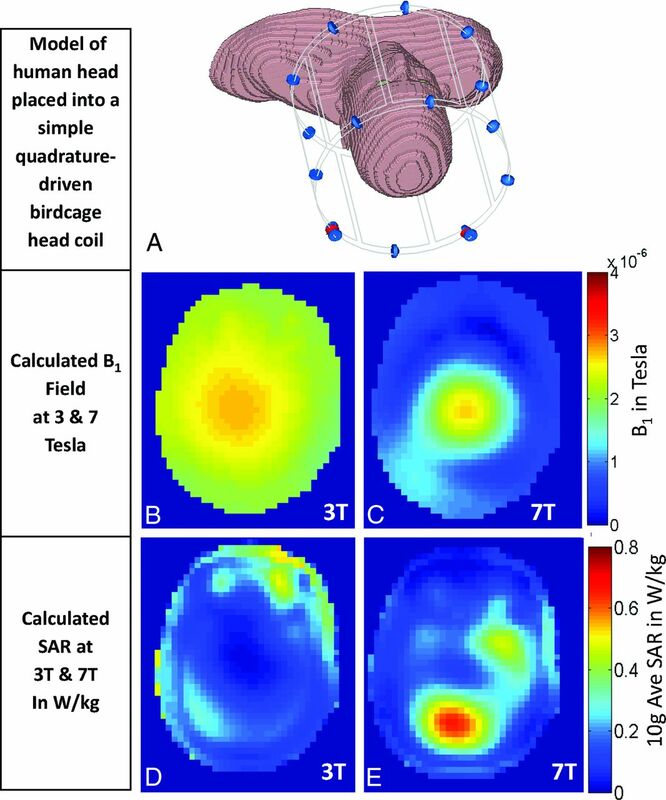 A, Model of a human head placed in a simple quadrature-driven birdcage head coil. B and C, Simulated transmitted B1 field (B1+) for 3T (B) and 7T (C). At 7T, wave-propagation effects cause more severe variation of the B1 field than is seen at 3T. D and E, Simulated SAR in the head model for 3T and 7T (in Watts per kilogram). SAR simulations show increased RF power deposition and greater spatial heterogeneity at 7T than at 3T. At 7T, one must contend with 2 physical limitations, the greater inhomogeneity in the transmit B1 field and the increased SAR deposition. These simulations were performed by Dr Bei Zhang at the Icahn School of Medicine, Mount Sinai, New York. A commercial finite-difference time domain software, CST Microwave Studio (Computer Simulation Technology, Darmstadt, Germany), was used to simulate electric and magnetic fields within the head for “Donna” in the Computer Simulation Technology virtual family. The B1 map was obtained by using 1W for the input power. The resolution of Donna is 1.875 × 1.875 × 2 mm3. Relaxation constants change as a function of field strength (Table). T1 values lengthen and converge for most tissues as the field strength increases. T2* values decrease with field strength, resulting in enhanced contrast due to iron deposits, calcifications, and deoxygenated blood but also increased signal loss at tissue interfaces on gradient recalled-echo images. The exact, heuristically derived relationships between T1 and T2* and B0 are provided in the Table. At higher field strengths, apparent T2 values also shorten for spin-echo sequences due to diffusion effects through microgradients surrounding capillaries. The specific effect on T2 will depend on tissue type. The apparent T2 was experimentally found to shorten from 76 to 47 ms in frontal gray matter and from 71 to 47 ms in white matter, when moving from 3T to 7T.71 Single-echo sequences such as diffusion-weighted EPI are particularly vulnerable to such T2 shortening. In addition, such single-echo or few-echo series have distortions due to B0 and B1 inhomogeneity. Sequence timing must be changed to account for these effects and achieve the desired contrast. In particular, longer TRs and shorter TEs are required to maximize signal and contrast. Increased Chemical Shift Localization Error. MR spectroscopy is planned within a volume of interest specified at the scanner. However, the precise location of the volume achieved shifts with the RF pulse and with the resonant frequency of the metabolite. This spatial offset is called the chemical shift localization error. Because each metabolite to be studied has a different resonant frequency, each metabolite volume is spatially shifted with respect to the others. As a result, the volume in which all of the metabolites can be imaged together is smaller than the volume initially specified. The degree of the shift is proportional to the magnetic field strength (B0), proportional to the section width, and inversely proportional to the bandwidth of the applied RF pulse. Cho and NAA, for example, are separated by 1.2 ppm. This translates into a frequency separation of 153 Hz at 3T, but 360 Hz at 7T. Because chemical shift localization error is linearly proportional to this frequency shift, the usable volume in which MR spectroscopy can be performed is reduced at 7T. Solutions to some of the technical issues at 7T include customized RF pulse and pulse sequence designs to produce uniform transmission profiles while minimizing deposited RF energy (SAR). Development of specialized hardware such as multiple transmit coils for RF signal transmission is also necessary. Customized RF Pulses and Pulse Sequences. Tailored RF Pulses to Compensate for B1 Inhomogeneities. Another solution to B1 inhomogeneity is to create pulses that are specifically designed to compensate for the nonuniformities in the B1 field. The B1 field map for every subject may be measured by using new fast and accurate B1-mapping methods.84,85 Then, 2D tailored RF pulses may be designed to cancel the B1 variation and achieve a consistent flip angle throughout the FOV.86,87 These tailored 2D pulses require less RF power than adiabatic pulses but may have greater sensitivity to B0 inhomogeneity. Parallel Imaging and Lower Flip Angle Schedules. Currently, the heterogeneous SAR profiles resulting from multiple RF transmission are not fully understood, limiting flip angles to very small values to remain within safety limits. Furthermore, such an approach requires acquisition of subject-specific field maps to generate the custom RF pulses and requires the scanner to be equipped with parallel transmit hardware. Thus it remains valuable to have single-channel solutions for uniform B1-insensitive, section-selective RF excitation. The ease of siting a 7T magnet has greatly improved in recent years. Because they are now actively shielded, 7T MR systems have become more compact and easy to site. Active shielding eliminates the need to place approximately 400 tons of iron shielding into the walls of the magnet room. Heretofore, such “passive” shielding may have been as thick as 12 inches (30.48 cm) to reduce the stray magnetic field that would otherwise emanate in all directions from the magnet. One factor in operating a 7T scanner has been helium boil-off. Newer magnets are “zero boil-off,” resulting in very little helium leak with time, reducing helium costs after initial magnet installation. A second factor has been economy of scale. Because manufacturers produce far fewer high-field magnets than 1.5T magnets, the unit cost of 7T MR imaging scanners remains high. Although prices vary according to vendor, 7T installations can cost approximately $10 million in the United States. As a larger number of research institutions and clinics adopt ultra-high-field scanners, these scanners will become mass produced, the manufacturing processes will become more streamlined, and the unit cost should decline. The number of ultra-high-field scanner installations continues to grow as researchers harness the increased signal to push the boundaries of resolution and contrast. Currently, there are forty-three 7T installations worldwide, 19 of which are in the United States. Five magnets have been installed that are above 7T field strength and 7 more have been ordered. 7T whole-body human scanners are still pending 510K approval by the US FDA. However, the FDA has already designated MR imaging scanners functioning at 8T and below as nonsignificant risk for adults and children. For infants 1 month or younger, this limit is presently 4T. Human research at 7T at medical and academic institutions is governed by their respective institutional review boards. Some manufacturers have announced interest in obtaining the FDA 510K clearance for 7T human scanners. The role of researchers and clinicians in showing the clinical value of these scanners in humans will be pivotal to obtaining this approval. Risks at 7T are similar to those at 1.5T and 3T. However, there are some added considerations in terms of patient comfort and safety. With regard to patient comfort level, the 7T scanner is very similar to 3T, except for limited transitory physiologic effects. Among the most frequently reported are dizziness and vertigo. These are due to magnetohydrodynamic forces exerted on ionic fluids in the inner ear as a person moves through the fringe field. To minimize these effects, patients are instructed not to move their heads quickly while near or in the magnet. For the same reason, 7T scan tables are programmed to move very slowly to ensure slow motion of the patient through the fringe field. Metallic taste in the mouth has also been reported and is likely due to electrolysis of metallic chemicals in dental fillings while moving through the field.94 All effects disappear when the person is out of the magnet. Noise Levels, RF Energy Deposition, and Peripheral Nerve Stimulation. Noise levels, RF energy deposition, and peripheral nerve stimulation are presently minimized by adherence to the conservative safety guidelines set by regulatory bodies such as the FDA and institutional safety committees. Acoustic noise in the scanner is a result of Lorentz forces on gradient windings producing bulk vibration. The Lorentz force is dependent on both the magnitude of the magnetic field and the orientation of the current-carrying gradient coil with respect to that field. For similar coil geometry and positioning, the Lorentz force should scale directly with the field strength. However, the exact scaling law between acoustic noise and field strength is difficult to determine because magnet bore and gradient coil geometry do play a significant role.95 Noise dampening, noise insulation, and encapsulation and sequence protocol design are used to bring noise down to comfortable levels, as specified by the FDA. At present, the safe noise level is set at 99 dB(A) with the use of ear protection.95 Systems have been tested to operate within these specified comfort levels. RF energy deposition within the patient, quantified as the specific absorption rate, is closely tracked by SAR monitors to ensure that the sequences used do not exceed the conservative safety limits specified by the FDA. Peripheral nerve stimulation, which is related to the speed of switching gradients, is also monitored and limited. It is not field strength–dependent. Currently, only 2 contrast injectors and a radiofrequency identification device chip are approved for 7T scanners.96 However, researchers are testing a wide range of implantable devices to permit 7T MR scanning in a wider range of patients. Ultra-high-field MR imaging has great potential to display in vivo subtle abnormalities that are not detectable at lower field strengths. Increasing the field strength provides opportunities to visualize subtle anatomic abnormalities associated with disease; reveal spatially varying metabolite ratios between smaller structures; isolate functional signal that is more tightly coupled to underlying neuronal activity; image microvasculature and blood products in great detail; and tap into the signal from nuclei other than protons, revealing new information about cellular activity. 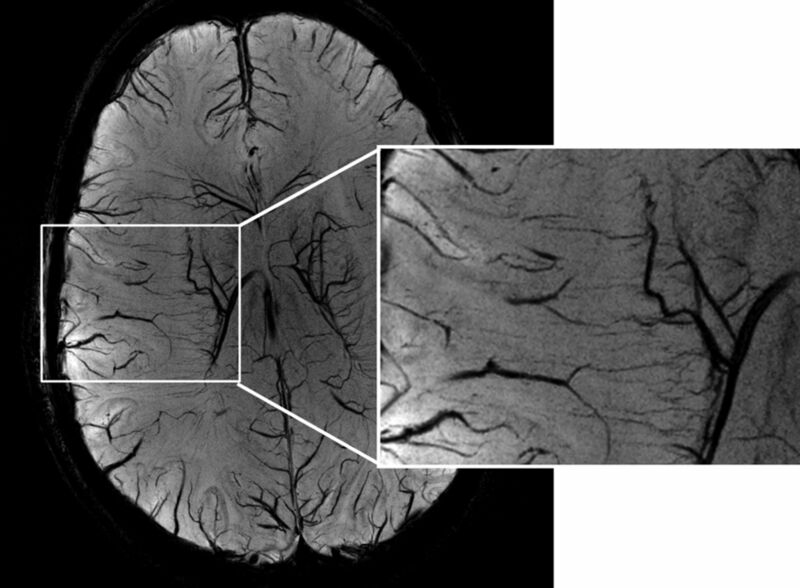 By using novel RF pulse and pulse sequence designs, we can overcome the technical barriers confounding ultra-high-field MR imaging and fully exploit the SNR advantage and enhanced contrast to visualize the brain in unprecedented detail. The combination of high-resolution anatomic, spectroscopic, and functional MR imaging at 7T has the potential to be a powerful, noninvasive toolset for improved diagnosis and treatment of a wide range of neurologic diseases and disorders. Continued technical development of new signal transmission and readout methods is needed to overcome the physical limitations of performing high-field imaging in vivo within reasonable times and appropriate safety limits. Additional clinical studies are needed to demonstrate the value of 7T for disease diagnosis, treatment, and management. It is expected that continued advances in high-field imaging will lead to a new understanding of neurologic disease and improved detection and treatment of such diseases. These will propel the field forward. We would like to thank Dr Christina Triantafyllou for providing information on the prevalence and availability of high-field MR imaging scanners and Dr Bernd Stoeckel for his input on current technical capabilities and limitations of 7T scanners. Disclosures: Priti Balchandani—RELATED: Grant: National Institutes of Health, Comments: NIH-NINDS R00 NS070821, includes support for travel to meetings for the study or other purposes; Other: Siemens*; UNRELATED: Grants/Grants Pending: National Institutes of Health,* Comments: NIH-NINDS R00 NS070821; Patents (planned, pending or issued): patents filed with Stanford University and Icahn School of Medicine at Mount Sinai, Comments: 1) Priti Balchandani, Daniel Spielman, and John Pauly, “Method to Design Adiabatic RF Pulses Using the Shinnar-Le Roux Algorithm,” US patent 8,473,536; 2) Priti Balchandani, Daniel Spielman, and John Pauly, “Method for Magnetic Resonance Spectroscopic Imaging,” US patent 7,966,053; 3) Priti Balchandani, John Pauly, and Daniel Spielman, “Slice-selective Tunable-flip AdiaBatic Low peak-power Excitation Pulse,” US patent 7,683,618; 4) Priti Balchandani, John Pauly, and Daniel Spielman, “Self-Refocused Spatial-Spectral Pulse Pair,” US patent 7,821,263; 5) Priti Balchandani, Rebecca Feldman, and Haisam Islam, “Implementation of a Self-Refocused Adiabatic Spin Echo Pulse-Pair Modulated Using the Power Independent of the Number Of Slices (technique for simultaneous B1-insensitive multislice imaging.” US provisional patent submitted; Royalties: Some royalties received from patents listed above; Travel/Accommodations/Meeting Expenses Unrelated to Activities Listed: Siemens, Comments: visit to 7T sites; OTHER RELATIONSHIPS: I am employed by Icahn School of Medicine at Mount Sinai. Therefore, I am financially supported by the Icahn School of Medicine Capital Campaign, Translational and Molecular Imaging Institute, and Department of Radiology. Some of the images included in this article were obtained as part of my research at Mount Sinai. *Money paid to the institution. This work was funded by the National Institutes of Health/National Institute of Neurological Disorders and Stroke grant R00 NS070821; Icahn School of Medicine Capital Campaign, Translational and Molecular Imaging Institute, and Department of Radiology, Icahn School of Medicine at Mount Sinai; and Siemens Healthcare.
. MRISAFETY.com. . www.mrisafety.com. Accessed September 20, 2014.